Its just way too hot in Cape Town today to do anything constructive in the garden. It was 38° Celsius (100.4 degrees Fahrenheit) earlier when I checked although it felt hotter at lunch time, so it could have been closer to 40 earlier on today. I’m waiting for the sun to go down before I do anything. I was forced outside because Dexter spent the afternoon keeping cool in the pool. I need to supervise him or he destroys the creepy crawley (he seems to think its an alien being and it’s an ongoing battle in summer to keep him from destroying it). I thought I would show you today how this patch looked before I cared and how it looks now. Its not fantastic – still needs work, but the whole garden is a work in progress so I’m not beating myself up over it. Here is how it looked just after we planted in October. 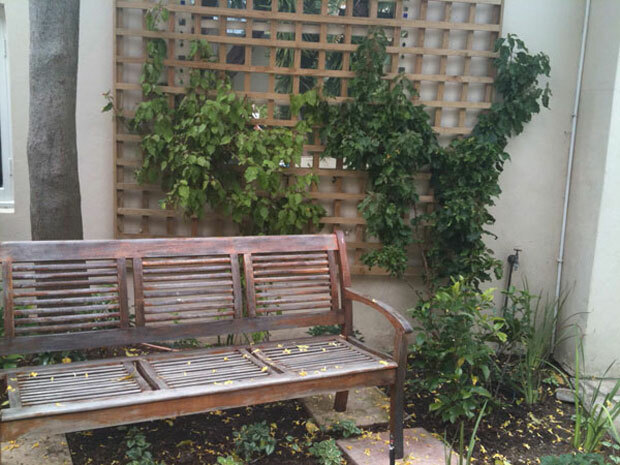 (The trellis is there to train the bougainvilleas upwards and hopefully eventually they will spill over the garage wall and pergola on the other side – that’s the hope!). This was taken on 6 February – a month ago. Looking a whole lot better already for just four months later. And here it is today (the back urn needs something in it – still looking for the right thing. I’m thinking something white). It is all very green and none of the plants are flowering at the moment except for the “Mona Lavender” which is on the right (and of course the potted Petunias, but they don’t really count). To the left of the bench there is a lot of colour provided by the Sweet Williams which I’ve previously shown. There are also a few Gardenias to the left and a Weigelia – both of which under-performed this year. I don’t know why. I gave them so much love and attention. I suspect the Weigela reacted to being re-planted from another position and I didn’t prune it correctly. But the Gardenias … I’m giving them one more year. I suspect it may be too hot for them here. It doesn’t seem that way because there is a big tree there, but its a narrow tree, and doesn’t cast a lot of shade so the gardening people mis-judge how shady the area is. The Bougainvillea didn’t flower because it gets too much water. But I wanted growth this year. We’ll “neglect” them next year to force them to flower. 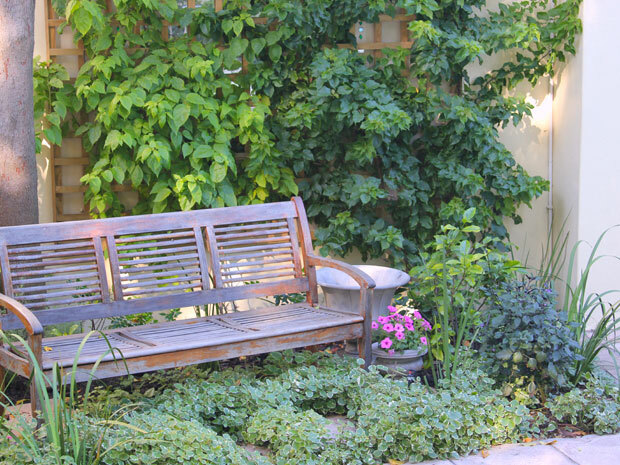 I like the rustic look of this corner of your garden. A good place to sit down and day dream away. Hello my friend. Thanks for sharing those before and after pics. Always good to see how much work went into the now photo. It was too hot for me today. If it was that temperature in Cape Town then it must have been 3 degrees higher here. Whew! I felt it today and so did my new plants. They were wilting by sundown so I spent the early evening watering and feeding. My tomatoes looked sunburnt and the broccoli leaves were totally chomped on. underneath them I found small caterpillars! Argh! Looks like I have my hands full tomorrow. I did, however, manage to harvest something from my garden. Will send pics later, I’m on my iPad in the lounge on the carpet with the fan full blast. 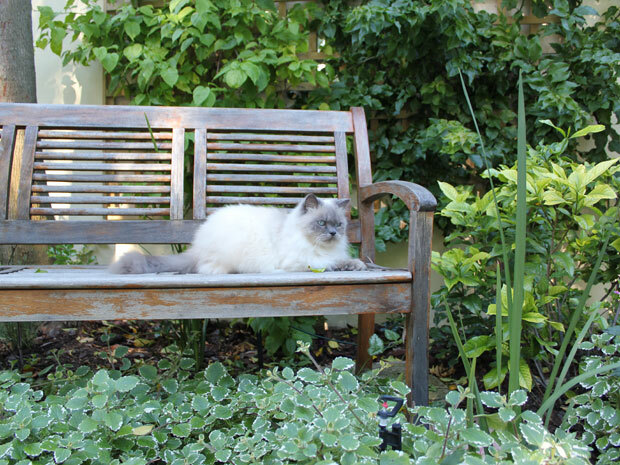 I love that bench, and it looks like a nice little spot in the garden. I wish I had a spot like that in mine — a wall or a solid fence would be a nice backdrop.